I used this project as a "leaders/enders" project but sometimes I just worked on it, just sewing, sewing, sewing (lots of time consuming cutting from the scrap bins too!). I knew I didn't want it to be a WIP I moved with, the long columns would be tricky to store neatly and I would've worried about the seams coming apart. The columns are uniform widths: 6.5", 4.5", 3.5", and 2.5" but I cut them in lengths with however long the scrap was- I hope that makes sense. Did I make a dent in my scraps? The definitive answer is no. But I did use up all my obnoxious rainbow fabrics I bought in the early part of my sewing obsession that I no longer care for, they're all on the back- I'll post a picture sometime. Sometime I would like to make this quilt again in a totally different, maybe more "grown up" color scheme. Wouldn't it be fun to make something like this in a pretty combination of navy, gray, and chartreuse? Or what about black, light pink, and gray? I don't know- the possibilities are endless. Since moving, I haven't done very much sewing at all. It took forever to be able to set up my sewing room- we ended up buying some cabinets from Home Depot to hold all of my supplies and I love them but they took forever to arrive. The last "unpacking" task was to assemble the longarm and pretty quickly, we learned that seven parts of the table had been lost. We searched everywhere and found EVERYTHING else we thought we were missing (except for two handmade items I am confident the packers stole!) but we did not find the parts. The longarm table is exactly 10 years old, I worried that the parts would not be able to be replaced. I had reason to worry- the whole process was a nightmare and honestly made me feel pretty depressed. I couldn't bare to sew during this stressful time. I barely hit owning the longarm for one year and it was looking like the entire system could be rendered obsolete. But finally, a week ago- the right parts arrived and we just need to set it all up. Amidst the longarm drama, over three weeks ago, I was hit with a nasty cold that I am still dealing with. I haven't worn real pants for longer than my outings to Urgent Care and I've missed every Christmas party I had planned to attend (four so far.... we'll see what happens this weekend). I am aching to get back to my favorite "coping skill" but I need to get better first. I am so sick of Netflix, I've lost 15 lbs, and I can't sleep in my own bed (a reclining couch offers some relief to my incessant coughing). Two of my three kids have caught the bug as well as one just recovered from pink eye, so yeah, it's been a rough month! I can't wait to get back to creating and really hope to be better for Christmas. All this is shared not only to vent but to explain why it's been so quiet around here. I hope to get back to creating really soon! This quilt came together in less than 3 weeks- once I finally had the plan- cutting and sewing took very little time. I love having my own longarm and the fact that I can just get something finished in my own home rather than seeking out the (less than stellar) options for renting a longarm in Colorado. I quilted an all over, boxy meander over the whole quilt with orange thread. I used some Rhoda Ruth wideback fabric for the backing and bound it in a blue stripe. I was hoping the completion of this quilt would help my son be ready to transition to the twin sized bottom bunk of our bunk bed set but he's still attached to his toddler bed. Oh well! It will happen eventually. About a year ago, there was an informal quilt-a-long on instagram for the Patchwork Swoon quilt pattern. I jumped in with an unusual color scheme: cream, black, and peachy pink. The quilt top came together really fast and I really enjoyed the process. As usual, I had plans to make the quilt bigger than the pattern specifications. I decided it would be cool to put smaller swoon blocks surrounding the large swoon motif. I did the math and cut everything. I soon discovered that my math was wrong and I stuffed it all into my closet and didn't touch it for nearly a full year! I have to admit that I really love how it came out! It's so pretty- and so "me." You might have noticed I love to have the color black in my quilts. I just think it adds nearly effortless contrast to every project. I love it! I decided to challenge myself and really quilt the quilt a ton- it was a great opportunity to practice my free motion quilting skills and I also embarked on "ruler work" (using a ruler to help guide the longarm to make designs). I felt like it was a safe project to practice on because the fabrics are so busy- no big blunders would be very noticeable. The quilting did take quite a long time and now I have a much better understanding as to why custom longarm quilting can be pretty pricey. About three years ago, I bought nearly a full bolt of this Juliana Horner fabric at Joanns for just over $20. It provided the perfect backing and binding for this quilt and I am happy I finally put it to use. When I have the opportunity to attend a quilt retreat, I have a specific approach to how I want to use my time. Going away for the weekend is a significant financial and time investment and I want to use the opportunity wisely. (Let me clarify that the retreats I have attended have been very affordable and well worth the $ spent!) I feel really gratified if I can start and finish a big project during that time. In years passed, I have completed the Kittens Quilt and the Typewriter Swoon. In the weeks leading up to the 2018 FRMQG retreat, I decided I wanted to make a quilt for my nephew, Rivers. I have made him baby and toddler bed quilts, and his mom had been offering to pay me to make him a twin sized quilt. She really loves what I make and I know I am appreciated. I didn't feel comfortable having her pay me to make him a quilt (we're family after all!) and I decided to just go for it, hopefully in time to gift it for his upcoming eighth birthday. So I chose the fabrics from my stash (lots of Sarah Jane motifs including paper hats, rockets, and bikes) and a pattern from the book By the Bundle by Emma Jean Jansen. 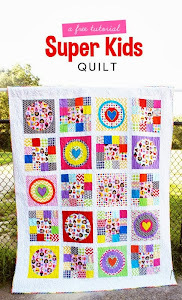 This pattern is called the "Hi Quilt"- so cute and easy! I had to buy gray sashing fabric and I pre-cut all of the pieces before I left for the retreat. Once I arrived to the retreat on Friday afternoon, I bound a charity quilt and then I got working on the Hi blocks. I get so intent when I sew and I really wanted all of my blocks done fast.... But I didn't finish all 99 of them until dinner time on Saturday. It took me a lot longer than I had anticipated and I'll admit that it was a monotonous process! The same thing over and over again for sure. Finishing all of the blocks at the retreat was all that I could do for the quilt at the retreat, there was no place to lay them out to sew them into rows. I assembled the blocks into a top at home and had the quilt on the longarm pretty quickly. (I should add that I ended up making 5-6 more blocks mainly because of a minor mistake I made in calculating how many blocks I really needed). A friend gifted me some quality polyester batting at a recent guild meeting, so I put that to use with this quilt. I quilted a somewhat dense boxy meander over the whole quilt- I really like that pattern lately- it's easy and forgiving. A friend let me play with her decorative stitches and I finally labeled a quilt! I haven't done this in years. I backed this quilt in this white/blue dot, I've had it for way too long, and even though it doesn't match the front super well, I used it anyway to avoid buying more fabric. I honestly don't love that my children's school has uniforms. Well, I actually love it for my oldest son. He's been picky about what he wears starting at a very early age, making us believe it was something he was born with rather than learned. So we don't have to fight with him about what he wears to school and that's lovely. But I would love to dress Charlotte in an entirely handmade wardrobe! The polo shirts and khakis are so glum when I think about the dresses and outfits I could be sending her off in everyday! But we like the school and one big draw has been that it offers half day morning and afternoon kindergarten- which means I get more time with her at home- and that's one of the many "positives" of the school. Recently, I got an itch to start sewing more knit patterns. I often hear other sewists talk about how easy they are to work with. I've done some knit sewing with Oliver and S and Patterns for Pirates patterns. I decided to turn to another popular children's pattern company: Violette Field Threads. I had this one yard cut of plum floral in my stash and decided to make the Amelia top. I cut everything out except the ruffle trim: I didn't have enough. I went to Hobby Lobby (where I had originally purchased the fabric) and couldn't believe my luck: they had a full bolt of the exact same fabric and knits were even on sale. I had bought this print at least 6 months ago and was merely hoping to find a coordinating fabric to use for the ruffle. I was very lucky! I made this top mainly because I was interested in altering the pattern to be dress length and I didn't have a lot of confidence in altering a pattern because I have never done that before (for clothing). I figured I would start by following the directions exactly and hopefully acquire the confidence to make some changes on the next try. At said Hobby Lobby knit sale, I bought two yards of this silky knit floral. It proved to be a challenging sew simply because of the stretchy-ness and thinness of the material. But I persevered! Shortly after finishing the dress, Charlotte wore it to lunch with me at a restaurant and a woman approached me and asked where I bought her dress. That's the first time that has happened to me! What a compliment! Finally, after making the Amelia top/dress twice, I decided to cut into the more pricey Art Gallery fabric I had grabbed during a Black Friday sale from ilovefabric.com This knit fabric was so nice to work with and I was much more confident making this dress after having had so much practice. About two weeks ago, Charlotte had an event coming: the Daddy/Daughter Princess ball hosted by her school. This was such a great event, completely put on by school parents and volunteers. She nearly insisted on wearing a store bought dress but found her choice to be too big (it was a really nice yard sale find that I bought and stowed in her closet). When I showed her the many stash fabrics she could choose from, for me to make a dress for her, I was quite surprised when she chose this understated cat face silhouette dot fabric from the Meow collection by Riley Blake. She had so many wild and bold choices with large cats, unicorns, and even squirrels- but this was great! I already had a plan and the coordinating fabric on hand. I made the Dainty Darling dress from the book Sew Classic Clothes for Girls. This pattern is not as well written as I am used to but my experience in sewing Charlotte clothes has helped build skills that help me in such situations. I bought Nick a $8 tie from TJ Maxx and they looked like the purrfect pair! I just love sewing Charlotte clothes. I really think it's helped to have start with such well written patterns by Liesl Gibson of Oliver and S. I recommend her patterns to everyone because I was able to follow them with confidence from the beginning of my journey in sewing Charlotte clothes. I have never taken any classes or had any kind of training. Even though Charlotte has to wear uniforms to school, she is able to wear all of these dresses to church every Sunday. Occasionally, there are other times when she needs to be dressed up too. I honestly would love to have another daughter to pass these clothes on to. I still have every handmade garment I've ever made her, there's no way I would donate them or get rid of them. I have another finish to share! This quilt came together fast thanks to its small-ish size, using charm packs, and having a deadline. I made this quilt for one of my favorite friends here in Colorado, Julie. I met her soon after I had moved from Massachusetts to Colorado and she's been such a blessing in my life. We met in MOPS (a mom's group) and I have faithfully attended her book group she soon formed after I met her. For a variety of reasons, I never expected that she would move from Colorado but her husband recently took an opportunity to work in Guam, a place they had lived before. My friendship with Julie has felt like one of the most genuine friendships I've had while living here and it's pretty sad to have her move so far away. I knew I wanted to make something special for her before she moved away, so I decided I would make her a quilt. I did a boxy meander all over the quilt, a motif I have been wanting to do on the longarm for quite a while. I bound it using the "Suzy's Magic Binding" technique. In an effort to save money and use the stash (but I have to admit I was sorely tempted to splurge on this Big Sky print for the backing), I created a scrappy backing with fabrics that matched the colors of the front. Sadly, with Julie moving, our book club is also dissolving. I'll admit that I am glad to get back to reading whatever I want, whenever I want- but this group has been a real life line during some pretty lonely years here. But I am happy to report that emotionally, I am doing better lately with the social dynamics I have encountered here. More on that soon! I have three "current project" containers and two of the three have been emptied out- I've been very busy! One of my best friends from my undergraduate days, Aimee, recently had her first child: a baby girl named Olivia. Aimee and I went on a semester abroad to South Africa when we were undergraduates at BYU. Later we were roommates again when I worked at a center for eating disorders after college graduation. A few years later, we reconnected when my husband went to law school in Boston and she was in the city working as a nurse. We don't always keep constant contact but when we reconnect, it's an effortless friendship. Several months ago, I learned that her nursery theme would be elephants. I totally have a "thing" for elephant fabric and I gathered all the possibilities from my stash. I have several juvenile and nursery elephant fabrics, but when I found this dramatic blue elephant fabric, I was really excited. Her husband is from India and when I asked her opinion on which elephant fabrics she liked, she picked this fun, India-inspired one (like I hoped she would). I had this "Taffy"pattern (a Jaybird quilts pattern) from a yard sale and other stash fabrics that easily coordinated with the project. This whole quilt came together in a mere three days- the large blocks, my excitement, and the fact that the baby came about one week early really spurred me on to get this done fast! I *almost* did a fast and simple all over FMQ design over the quilt but I am glad I decided to have some fun with different thread colors and motifs within the quilt. I did a tiny bit of straight line quilting on the purple fabrics on my domestic machine after I did most of the quilting on my longarm. This is definitely the kind of practice I need to do to improve my longarm FMQ skills! I also did a new-to-me binding technique: Suzy's Magic binding, a tutorial found on my friend Marti's blog here. It's a pretty easy technique and joining the ends together worked easily; I used the technique that I always do (found here). Finishing this binding is done by machine, something pretty necessary when it you think about the wear and tear that comes with a baby quilt. I backed the quilt in a Marden's find: an Outfoxed print by Lizzy House plus some fabrics from the front to make it big enough. This holder/pad is SO handy for being out and about with a little one. You know how awkward it can feel to do a quick change at a playdate or you have to change your little one in a public restroom- this is so functional for guarding the environment from any mess as well as protecting the baby from germs. It goes right in the wash easily too. Another item I really like to have for a baby is a nice big receiving blanket. I buy 1.25 yards each of two coordinating flannel fabrics. I prewash them and trim them to the same size. I round the corners with a plate or bowl and sew them together with a big hole for turning. I flip it all right side out and do a generous edge stitch to complete it. I find these so useful for all types of weather, it can be a makeshift car seat cover, it's great for swaddling, and it's so much more useful than those tiny, one-layer store-bought receiving blankets. Finally, I made some burp cloths for both babies. My first baby was such a spitter- I literally had about 25 of these in rotation. I've gifted these to friends many times and I always receive grateful feedback. Sewing for all these sweet babies has been a lot of fun. I think I'll be sad when I am out of this phase of life when I can sew for little ones so frequently. Linking up to Finish it up Friday at Crazy Mom Quilts. My first big finish of 2018: the Union Jack quilt! I am so excited to have this long-term WIP completed- I started it almost three years ago. It's probably the biggest quilt I have ever made, measuring 98" x 116"! Finding a way to photograph it without it dragging on the ground was a challenge- so my husband agreed to help me with a roof picture. My initial motivation to make this quilt were two simple factors: It is very easy paper piecing that I wanted to try and I loved how large scale prints could be showcased in the flag blocks. I do not have a significant love or affinity for England. I had a full day layover there once and that's about it- I'll admit that I am not really that excited about this quilt overall; it turned out how I wanted but it doesn't have that "wow" factor for me personally. The pattern for this quilt came from issue #8 of Love Patchwork and Quilting Magazine, Lynne Goldsworthy is the author of the pattern. To back this quilt, I unearthed a very long-ago purchase of Joel Dewberry Heirloom fabrics. I love Joel's work and fabrics, but I don't tend to grab them first, as an exciting addition to my projects. I'm often trying to to use what's in my stash, even though the colors don't coordinate perfectly with the front. I bound the quilt in a Patty Sloniger Bakeshop fabric. I quilted the quilt myself on my longarm- a process that easily took over 10 hours. I thought I might do some twirly-swirly stuff in each of the flags, but decided my FMQ skills weren't good enough, I didn't have all of the right color threads to make it tone on tone, the width of my longarm quilting space isn't large enough to accommodate the vertical rectangles in the center of the flags, and I really just wanted the quilt finished sooner than later. I felt a little guilty about not being more intricate with the quilting but the truth is that I don't love this quilt SO much that I want to spend hours and hours finishing it- I got the three layers together and didn't resort to simple stippling, which makes me happy. It's done and that's what matters. Thanks for reading! This post shows that I actually completed my January goal via the "One Monthly Goal" initiative by Elm Street Quilts- thanks for the motivation Patty! 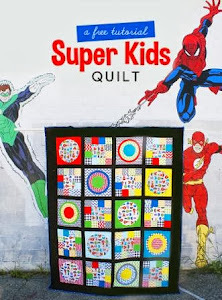 Also linking up to Finish it up Friday at Crazy Mom Quilts.